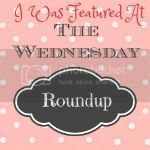 Hello and welcome to The Wednesday Roundup #59! We are so glad to have you here with us! I hope you are having a fabulous week! In addition to sharing our latest links, we will also be growing our social media following on Pinterest! Please link up your profile, find some new people to follow and gain a few new followers too! If you are here for the first time, please leave a comment below so I may personally welcome you! Thanks for hosting this weekly link-up party. Hope you can join us on the Merry Monday Link Party this week. Thank you for featuring my Cilantro-Lime Slow Cooker Pork Roast recipe from Hello Nature! You are so welcome Jessica! Hope you have a great week and thanks for stopping by!